The format works beautifully— for “a mesmerizing half hour or so,” said Mikael Wood in the Los Angeles Times. When he’s talking about his parents and drifting into intimate songs like “My Father’s House” and “The Wish,” you “almost forget you’re in a theater surrounded by other people, so evocative are his images.” He’s good, too, as he uses “Tenth Avenue Freeze-Out” and “The Promised Land” to recall putting his band together and working to hit it big. 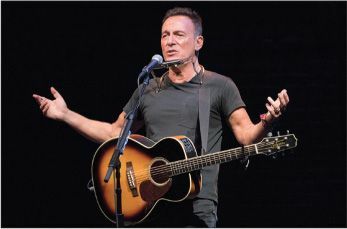 But after a nice interlude during which his wife, Patti Scialfa, joins him for two duets, the show, on opening night, “kind of fell apart.” The adoring crowd wanted to sing along when the star launched into “Dancing in the Dark,” but he told them not to. At the moment when his fans wanted release and the joy of feeling united in song, he insisted on proceeding alone, with just his guitar, piano, and harmonica. 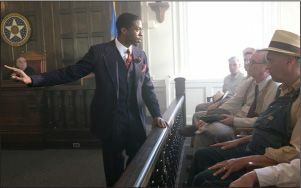 A young Thurgood Marshall flashes his courtroom talent. 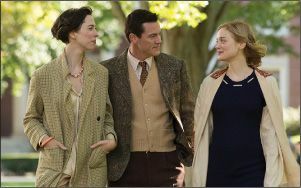 A love triangle gives birth to a superheroine.